Protest Song Contest: WIR SIND IM VORFINALE ….!!! WSF Tunisia 2013: Assembly of Migrants and Solidarity Associations at the / Assemblée des Mouvements de Migrants et des associations de solidarité / Asamblea del Movimiento de l@s Migrantes y de las Asociaciones de solidaridad / Assemblea dei Movimenti dei Migranti e delle Associazioni di solidarietà / نداء من آجل تنظيم جمعية عامة لحركات المهاجرين و الجمعيات المساندة لها, اُثناء المنتدى الاجتماعي العالمي- تونس 2013. Denn wir glauben fest daran: STRUGGLE! UNITY! RESISTANCE! 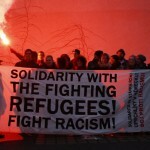 / We believe in Unity, Resistance, Struggle! / Nous croyons en l’Unité, la Résistance, la Lutte! “We love you, Vienna, je t’aime, Vienne” – Song und Text, jetzt online! Wir sind zu Fuß von Traiskirchen nach Wien marschiert. Wir haben ein refugee protest camp aufgebaut. Wir haben die Votivkirche besetzt. Wir haben einen Hungerstreik gemacht. Die Regierung ignoriert unsere Forderungen. Stattdessen schickt sie die Polizei um unser Camp zu zerstören und einige von uns in Schubhaft zu sperren. Die Regierung hört unsere Argumente nicht. Vielleicht hört sie unsere Musik. 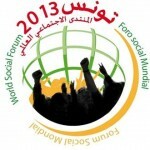 During the next World Social Forum to be held in Tunis March 26 to 30 the theme of migration will be one of the most important points of discussion. 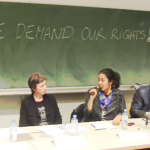 On 30th of January, 2013, a debate of experts, scientists and refugee activists took place at the University of Vienna. Together the demands and perspectives of the protest were being discussed. / Am 30.1.2013 fand an der Universität eine Diskussionsveranstaltung mit ExpertInnen, WissenschafterInnen und Refugee-AktivistInnen statt. Gemeinsam wurden die Forderungen und die Perspektiven des Protests diskutiert. 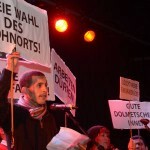 The refugee protest song, “We love Vienna, je t’aime Vienne” will be performed first time publicly in the preliminary competition on Friday 25th of January 2013 in Vienna. Demonstration vom Volkstheater über die Votivkirche zum PAZ Hernalser Gürtel, in dem noch immer vier Aktivisten in Schubhaft sitzen. 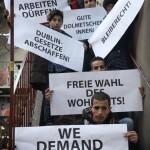 Demonstration in Vienna in solidarity with the four refugee protesters who are in deportation detention. Manifestation in Vienne in solidarité avec les quatre manifestants réfugiés qui sont en détention d’expulsion. Data and information about the boat people of the Sicilian Channel have been collected throughout the years 2011 and 2012. The reports (in French) show data and recommendations to the Tunisian and European authorities. 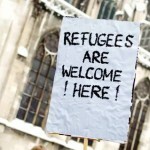 “A short while ago, I heard that refugees found shelter in a church, where they began a hunger strike. They have surely sought shelter in this church because they were scared, scared of being arrested by the police and deported into their countries of origin.